Taber bantam “AA” Golden Suns (9-14-4) were victorious in both of its road South Central Alberta Hockey League games on the weekend. The first was a 3-1 win over Red Deer Ramada (8-13-5) on Saturday afternoon, scoring three unanswered goals in the third period. Brinley Degenstein tallied twice to go with an assist and Nathan Verloop notched a single to go with two assists. Landon Porteous earned the win in net, facing 17 shots on goal. The team proceeded to earn an identical 3-1 victory over Red Deer Steel Kings (9-17-1) on Sunday. Rylan Millo potted two goals and Kade Degenstein a single. Verloop had two assists. Scout Sidam earned the victory in net, facing 32 shots on goal. 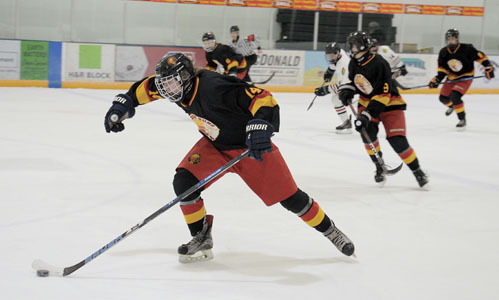 Taber bantam “AA” Golden Suns host Red Deer Ramada at 8 p.m. on Saturday at the Taber Arena. The team then travels on Sunday to take on the Wheatland Warriors. MIDGET: Taber midget “AA” Golden Suns (14-10-3) won big on the weekend, earning two lopsided SCAHL victories. The first was a 9-0 road blanking of Foothills Bisons (0-26-0) on Saturday. Josh Verloop tallied twice and Ryden Rempel, Kolby James, Brogan Booth, Mason Sande, Kole Fujita, D.J. Tonin, and J.D. Hall had singles. Dallas Bodnar had three assists. Ethan Barrows earned the shutout, stopping 19 shots on net. The team proceeded to earn a 9-2 victory over CRAA Gold (5-8-0) on the road on Sunday. Jayden Kostiuk had the hat trick and James, Fujita, Sande, Hall, Tonin and Booth had singles. Barrows earned the win in goal, facing 35 shots on net. Taber midget “AA” Golden Suns do not return to SCAHL play until Feb. 8, when they host CBHA Blackhawks at the Taber Arena at 8:30 p.m. The team then hits the road on Feb. 10 against CBHA Rangers. PEEWEE: Taber peewee “AA” Golden Suns host Cranbrook Wings at the Taber Arena on Saturday at 5:30 p.m.